Prospekt has a duration of about 2-3 hours; just short of Half-Life 2: Episode One in terms of length. 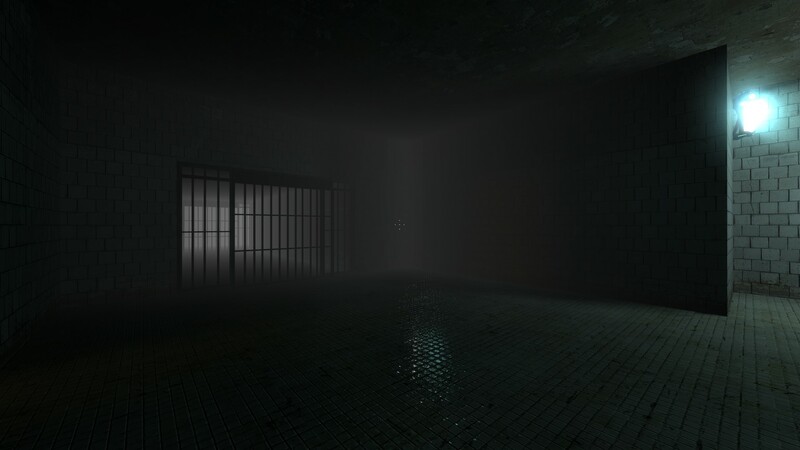 Gameplay takes place initially in the titular prison, but later moves to other areas including a brief return to Xen, the alien borderworld. The gameplay itself sticks very closely to the mechanics of the base game, featuring no new weapons or enemies, although some new graphical assets are present. As mentioned above, players take on the role of fan favourite Adrian Shepherd as he returns in the Half-Life 2 era. 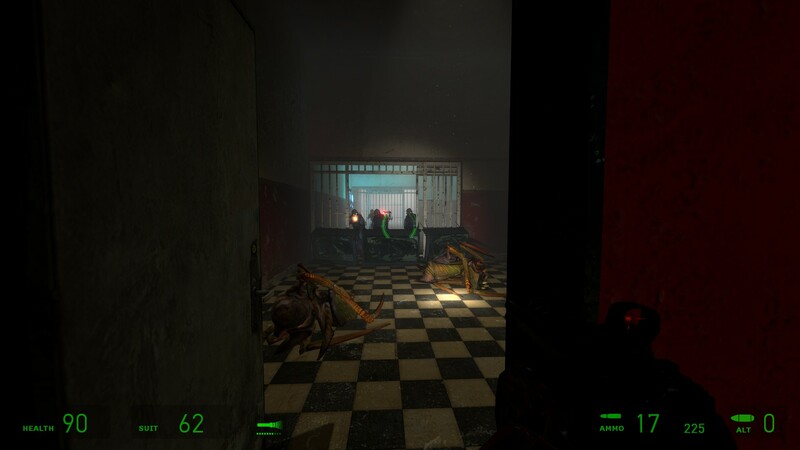 This role is firmly established through the use of audio flashbacks throughout, which introduce us to the Corporal’s squad in the weeks prior to the Black Mesa incident. There is a fairly significant amount of custom voice acting here, including some by community regular Harry Callaghan, and it is all generally performed well. 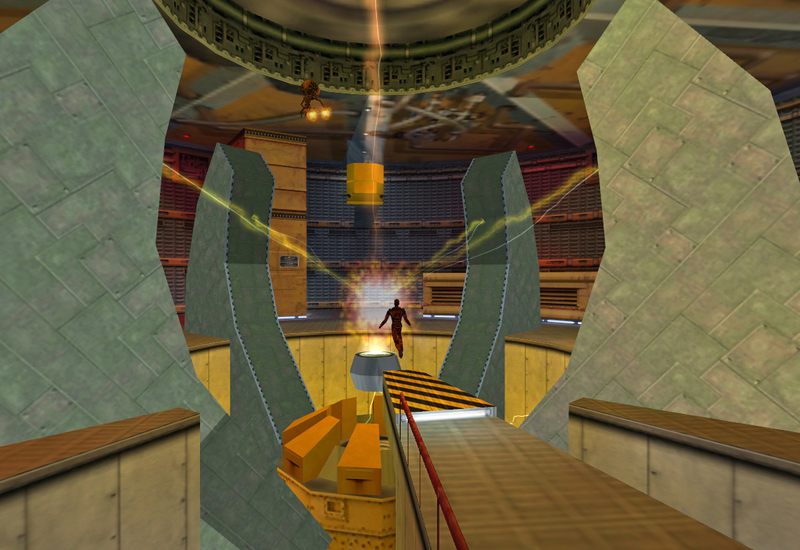 In addition, the context of the game itself is explained by a long introductory monologue by a vortigaunt responsible for releasing Shepherd from stasis, who explains his new place in the Half-Life timeline. Unfortunately, while these aspects are well made on a technical level, there is no cohesive story to be found. The initial set-up is long and somewhat heavy-handed, being sure to labor over an extensive summary of the games up to this point. It would be unfair to expect the subtlety of Marc Laidlaw’s writing, but would have been preferable to have some visuals supporting the dialogue, or at least to spread the exposition across the mod rather than front-loading it all. 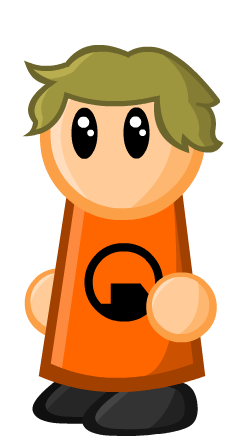 In fact, the game’s advertised story of the player aiding Gordon Freeman is not mentioned at all after this point, nor is it reflected in the gameplay. 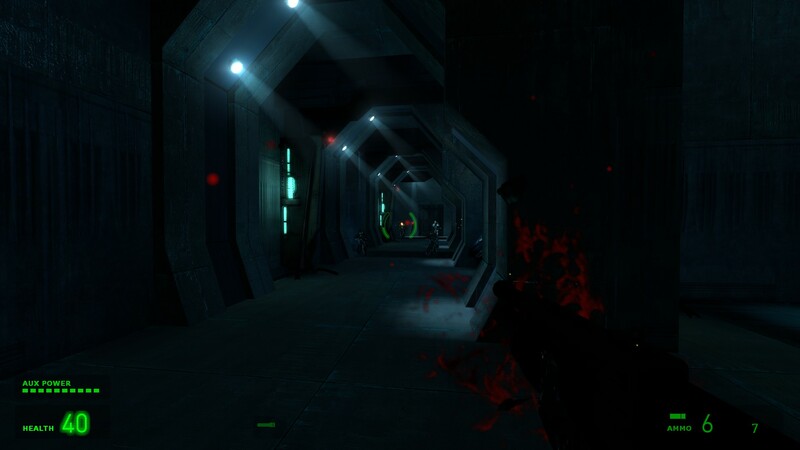 Given that this is the central idea of the game, it would have been nice to visit some areas seen in the original game, and to be shown a clear influence of our actions – perhaps a cameo from Freeman like that in the original Opposing Force? Further, the player’s casting as Adrian Shepherd is completely irrelevant to this story. The flashbacks we are given, while interesting enough, provide no insight into either current events, or the character of Shepherd himself. In fact, they only serve to repeatedly remind the player that we are Shepherd in a way that comes across as fan service and is not really necessary to the experience as a whole. The vast majority of Prospekt is built from stock Half-Life 2 assets. Given that it’s set entirely in familiar environments this is no bad thing. In addition, there are a range of custom sounds, models and textures scattered through the maps. Where these new assets are applied well, they allow for a few stunning locations. In particular, the cooling tanks of a nuclear power station (directly above) make for one striking environment, with the bright blue pools contrasting with cool concrete and warm sunlight pouring in overhead. 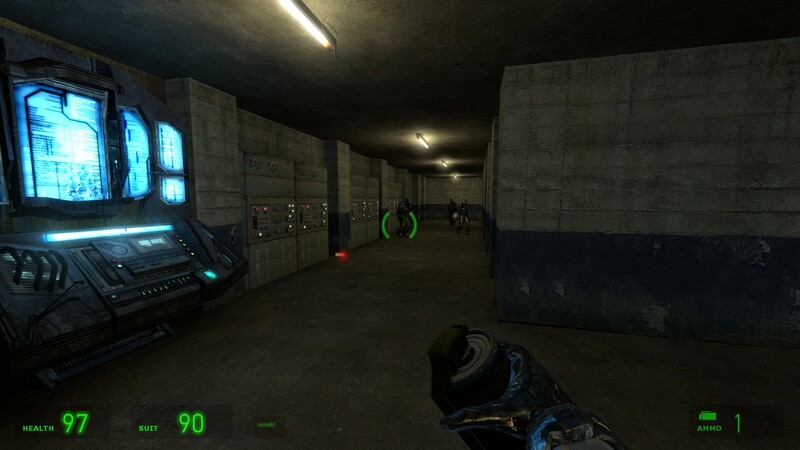 Visually, the game is at its peak when it showcases Combine architecture (also shown above), where it’s clear that a huge amount of attention and care has been put into getting the small details just right, from the glossy reflective floors of large chambers to the pipes and vents of the crawlspaces beneath. 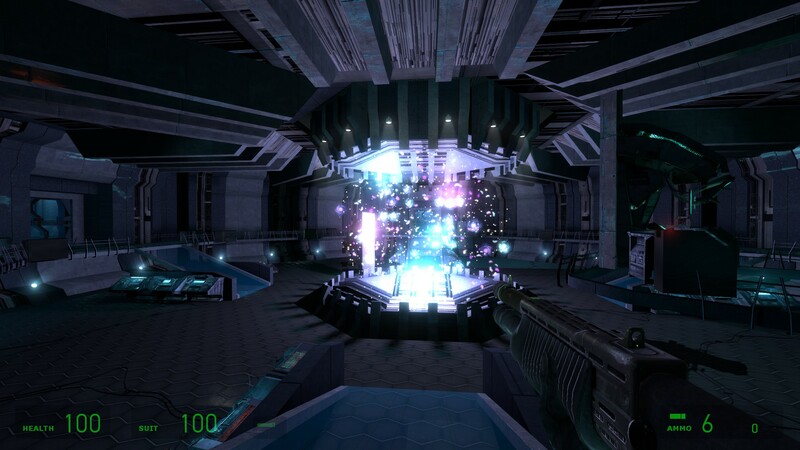 Furthermore, an extensive set of new particle effects allow for some interesting new visuals, like a huge map of galaxies presumably under the Combine’s control. It almost feels like some areas have been well detailed purely to make nice screenshots, while others have been sorely neglected. Outside of these “beauty spots” there is a lack of detail props and decals, two of the simplest tools available to a mapper, to keep things visually interesting. The architecture is flat and lacks interesting geometry. The effect of this is that overall the game struggles to come close to the Half-Life 2 look and feel we are used to, and the problems are only made more striking by the detail visible elsewhere. Beyond this, there are a few examples of bad mapping practice that all level designers should know to avoid. Simple things like doors opening the wrong direction, blocky staircases and out of place dynamic shadows add up to an unpolished impression which could have been alleviated. And while new assets are welcome, they are not always well utilized. There have been some strange choices, such as replacing the Combine soldier models with higher fidelity versions, when everything else remains at the same level of quality. Their voices have also been replaced, which doesn’t add anything (apart from inconsistency with the original games) and the effort might have been better spent elsewhere. The use of new effects and filters could be toned down, as they are eyestrain inducing in some cases. How the game actually plays is of course a lot more important than any of the aspects covered so far, and it’s sadly also where Prospekt’s most serious issues arise. The game starts positively in this regard. There is a slow build-up; the player is allowed to explore and presented with some simple but neat puzzles. 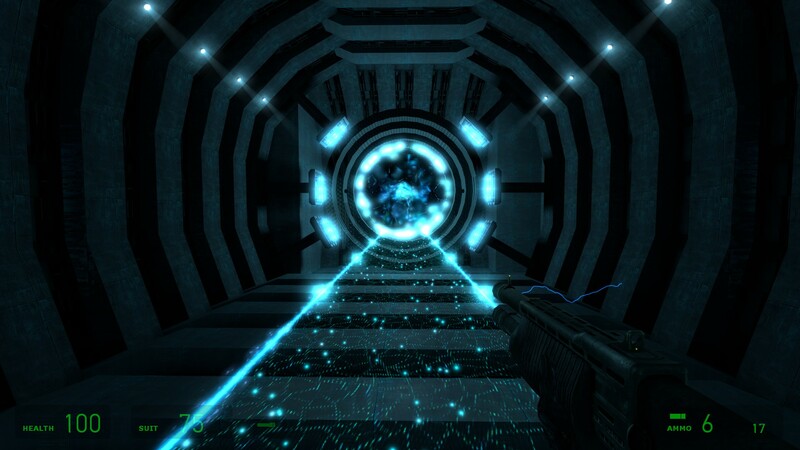 In fact, the most enjoyable section in gameplay terms was a puzzle-based interlude later in the game, which sees the player exploring the innards of a Combine installation, dodging lasers and crawling through maintenance tunnels. But these kind of experiences are all too infrequent. Unsurprisingly, the majority of the gameplay is combat based. This wouldn’t be a problem if the combat didn’t have the same fundamental problems throughout. As an example, let’s take the player’s very first encounter with the Combine. We get into a small elevator and ride it upwards out of the underground area we’ve been exploring. The gate opens, directly onto a corridor containing half a dozen waiting Combine soldiers, in addition to a deadly mounted gun. We are still trapped inside the elevator, and have no options for cover, or any room for tactical manoeuvres. The only course of action available to the player is to run into the area, take damage and take out the enemies by brute force. This example is one of many. Several areas are not designed with gameplay in mind and often lack cover or alternate routes for the player and enemies to traverse. Most encounters devolve into either sniping inaccurate enemies from a distance, or else “doorway combat”, where enemies are funnelled into a room one at a time and hiding behind the doorway is the easiest way to deal with them. It doesn’t help that the enemies encountered are almost exclusively soldiers, making the combat very repetitive. The game shoots itself in the foot by making battles longer, more intense, and with shorter breaks between them as it progresses. As it continues, it is noticeable that the player is often being given copious amounts of health and battery pickups, which is necessary to compensate for the unavoidable damage the player takes. And to compound matters, the health of Combine soldiers has actually been increased! Resorting to god-mode at some point is to be expected. 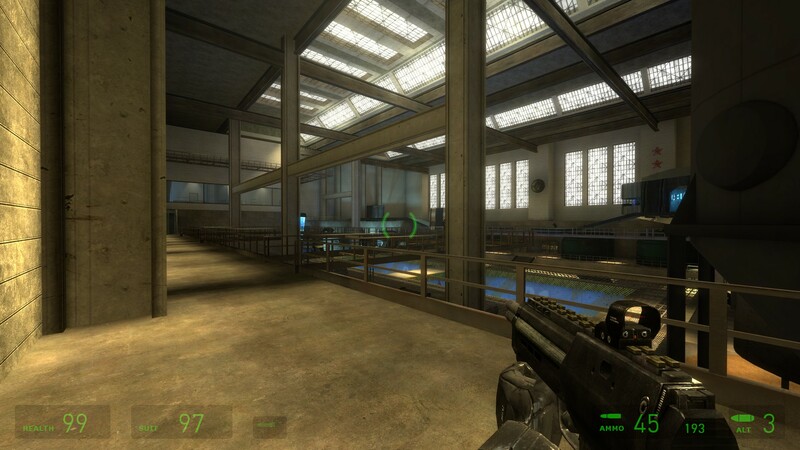 In Half-Life, entering a new location would mean a new and refreshing style of gameplay. 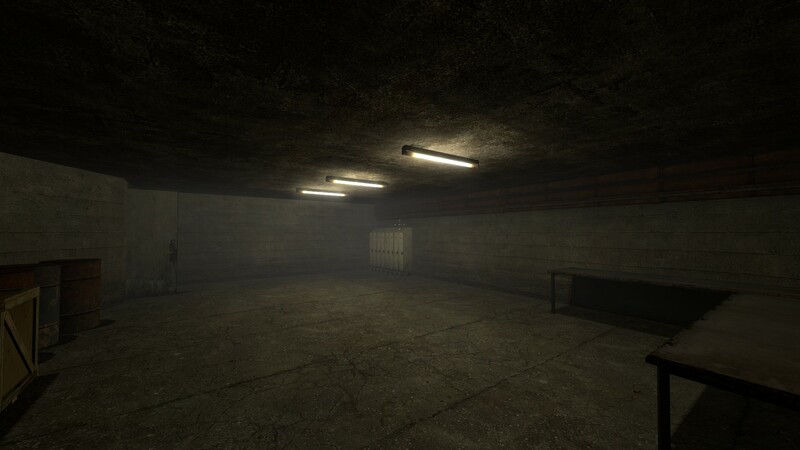 In Prospekt, we are teleported into a range of new environments. A trip to Xen could have been a valuable opportunity for a break, a change of pace, and some new and interesting gameplay. Instead it was short, justified in neither story nor gameplay terms and did not serve much purpose other than to make a reference to the original. Beyond combat, some issues arise with the level design as a whole. There are frequent issues with a lack of “signposting”, that is, making important information apparent to the player. 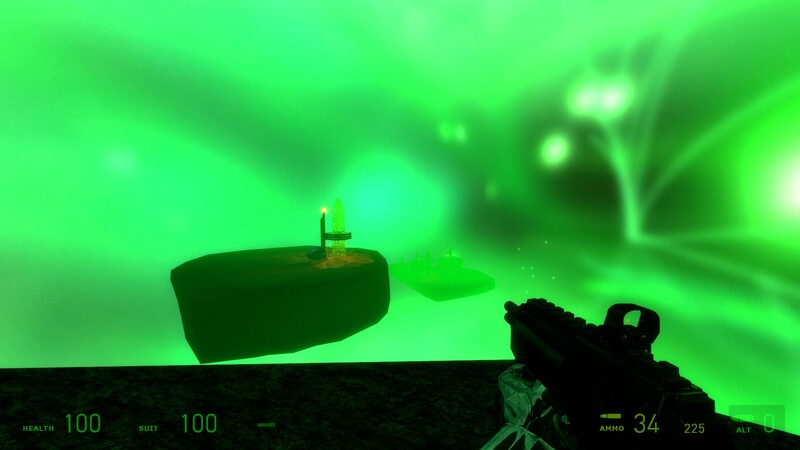 Examples such as using lighting to highlight important objects, demonstrating that certain areas are hazardous without killing the player, and making the overall objective of a level clear should be employed to prevent player frustration. The player’s journey could be made more meaningful with the use of loopbacks, seeing an old area from a different perspective or getting a glimpse of where they are going. 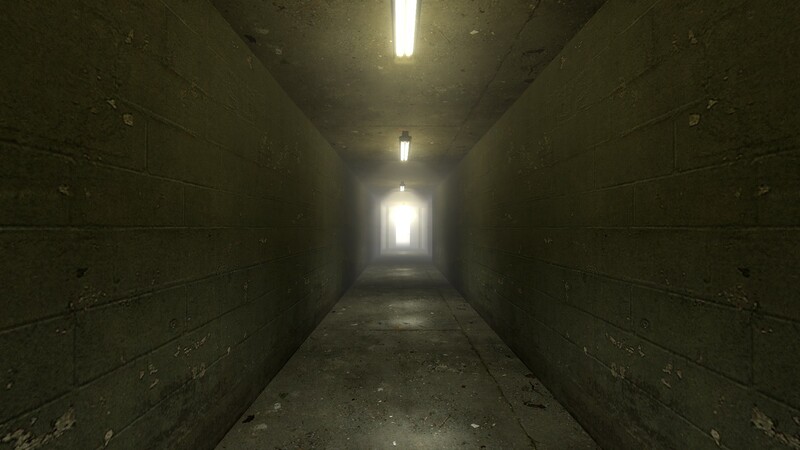 Instead, there are often occasions of pointless backtracking, where the player has to run back through previously explored corridors, without anything new to make it worthwhile. There are many things that Prospekt does well, and from a technical perspective it is well made and offers some impressive visuals. Almost all of the issues discussed above are found in many Half-Life 2 mods, even those that are well received by the community. However, with Prospket being given a price-tag and released as a full game, it is impossible not to hold it to a higher standard. When most mappers release their own work for free, it is reasonable for the community to expect more from a paid product. This is not to say that Prospekt is, as a game, bad, or that mod makers should not be entitled to try and profit from their work if they see fit, but it is up to the players to decide whether mods such as Prospekt are something they are willing to pay for. This review was written by Source mapper and Half-Life fanatic MisterAddy, creator of the Half-Life 2: Episode 2 modification Uncertainty Principle. The views expressed in this article are of his own experience. If you enjoyed this post, you can read more of his articles here. Great review MisterAddy, I agreed with most of this review, Prospekt wasn’t ‘bad’ in my opinion, it just needed a lot of work and better implementation (heard of Early Access Richard?). Still would like to see more from him, maybe a mod text time? I personally enjoyed Prospekt because of the visual appeal. The xenian space station built in Earth orbit is super gorgeous. The older buildings (like the one with water coolants) combine well Soviet architecture and symbols (did you notice the Coat of Arms on the wall?). But my biggest complain is that the player never interacts with those new technologies. They’re just put there for a visual appeal. You never interact with the water tanks. You never interact with the huge Galactic map. You never interact with the huge portal which is located on the space station and obviously transports gunships from the station to Earth. All you do is to push big obvious buttons to open doors. guys, Xen’s purpose in the Half-life universe plays a huge part in teleportation. Xen was used as a terminal where any human – or species, for that matter – using teleportation, would first land in Xen, then continue teleporting to their destination. in this game it acts the same way, Adrian is sent to Xen from prospekt, then to the orbital structure just outside of Earth. You’re right! That was Xen and it was exactly the Borderworld of teleportation from a point A to B which is the essence of Half-Life story. In my opinion, it is a brilliant implementation of Xen even if it should have been a little bit longer. But as Richard said, it is the only Xen excursion since Half-Life 1 release. So, bravo to him! Else, did someone find the game a bit hard in “hard” difficulty? Sometimes, I found combats against combines long, tough and annoying.